Today’s activity was bingo and making friendship bracelets! 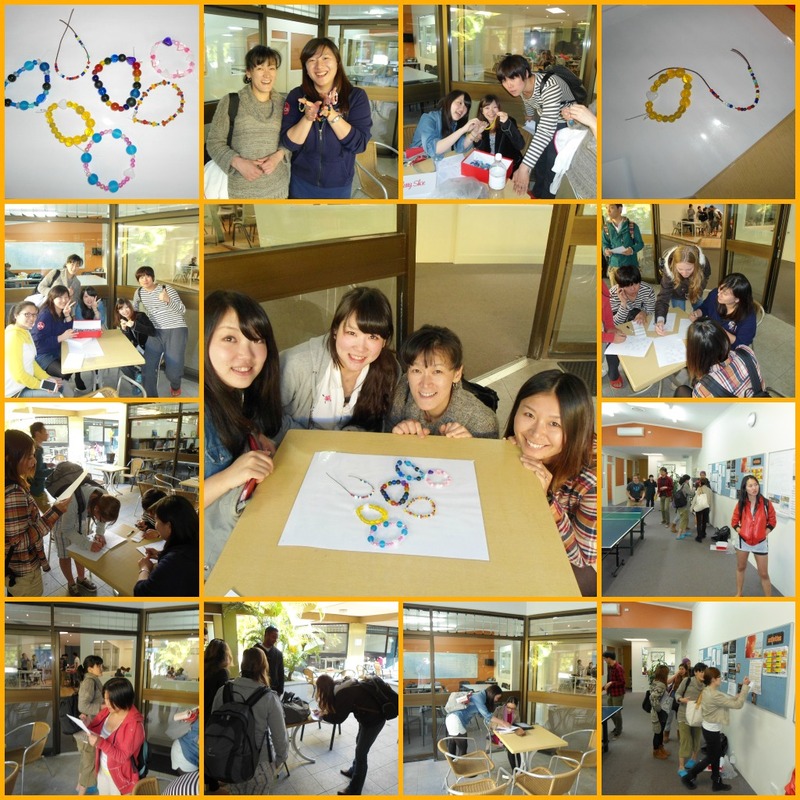 Our students must have lots of great friends as there were some amazing bracelets! Say ‘hello’ to your new friends at Lexis Noosa! It’s a stunning day today with blue skies and lots of sunshine. What a great way to start the week off and welcome your new classmates! Angela Kaufmann (Switzerland), Jinwoo Chung (South Korea), Keehoon Kim (South Korea), Dominik Simon Bielsler (Switzerland), Frederico Da Cunha Araujo (Brazil), Lydia Brigitta Lussi (Switzerland), Michel Rota (Switzerland), Sylvie Rota-Massard (Switzerland), Federica Leonardi (Italy), Michael Christian Brunner (Switzerland), Sebastien Rota (Switzerland), Yusuke Kurata (Japan). It’s a family affair at Lexis Noosa! A big welcome to the Rota family who have joined us at Lexis Noosa! 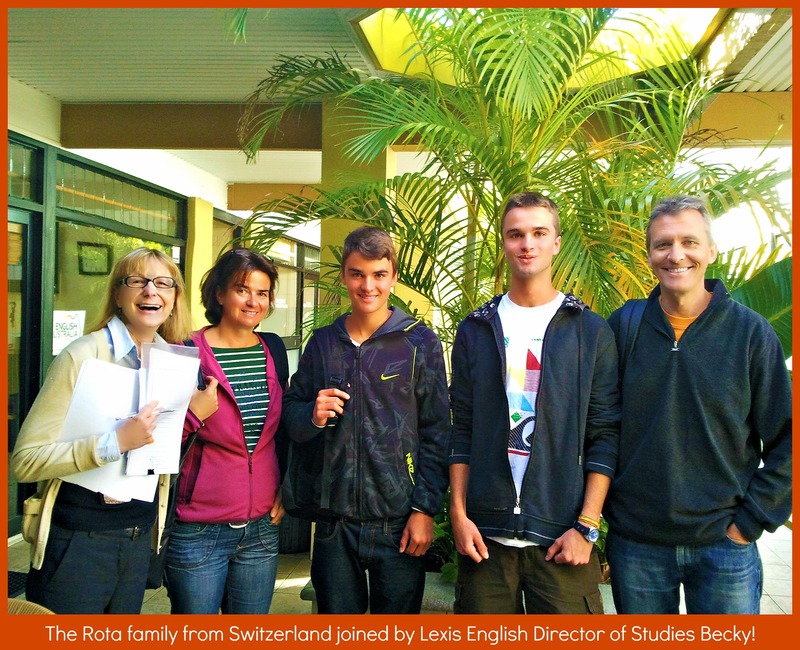 The Rota’s will join our General English program and Jonas will be taking part in TAP. We hope the Rota family have a memorable stay in Noosa! Olympic fever hits Lexis Noosa! Today’s activity was the Lexis Olympic Games. We had nine teams competing. 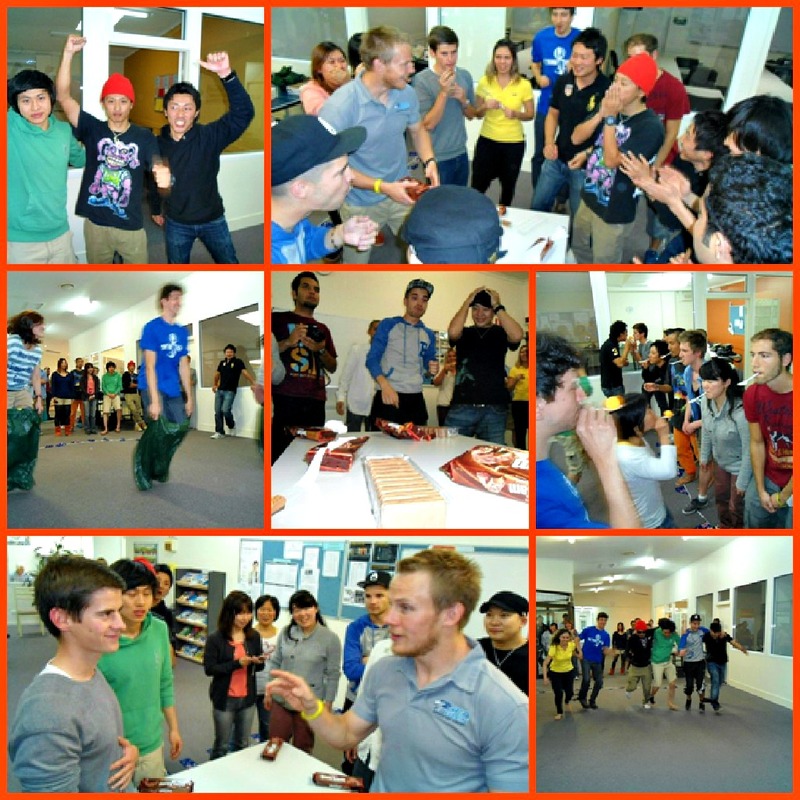 Games included, egg & spoon race, sack race, 3-legged race and Tim Tam eating competition. Japan won! Lexis Noosa students hit the stage…next stop Broadway! Today we had the English Through Drama option class performances. 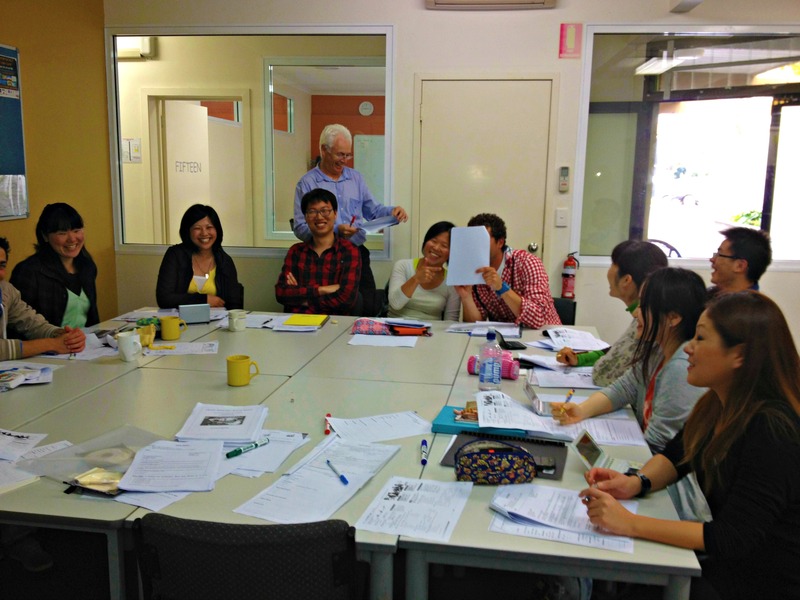 The class performed 3 plays, The Bus Stop with Donny, Midori and Ayumi; The Superlative Vacuum Cleaner, with Kaoru and Dong Sik; and The Doctor, with Julien, Dong Sik and Polly. The whole school came to watch and enjoyed it very much! REVIEW ALL THE AVAILABLE JOBS FOR THE WEEK! Set within the grandeur of two of Brisbane’s most iconic heritage buildings in the heart of the CBD, sits Treasury Casino & Hotel. We currently have a number of fantastic opportunities for fun and professional customer service focused people to join our opening team. We are currently seeking a number of casual Waiters and Fun Runners to be part of this exciting new restaurant. If you are ambitious and driven and want to be a part of Brisbane’s ultimate entertainment destination, apply now! Treasury Casino & Hotel is launching a new premium Bar and lounge in August. This new premium bar and lounge will be an experience that transforms from day to night, the new bar will bring some wow factor to the CBD. The successful applicant must have experience in a similar role and not only drink coffee, they must LOVE IT! Works well as part of a team but also can be independent if required. RSA Certificate will be required. You must be available 7days a week, between 6:30am to 4:30pm, for up to a 38hr week spread over 7 days. This includes weekends. We are currently looking for experienced, well presented people to take up Wait Staff roles in our Spanish Garden Steakhouse. These roles would suit someone who takes pride in their work & are focused on providing a high level of customer service. A current Responsible Service of Alcohol certificate is required. All Staff must have the flexibility to work nights & weekends. Due to an increase in demand for our delicious food, suitably qualified persons are invited to apply to join our professional kitchen team. Only persons that are reliable, have high standards of work ethic and hygiene and cope well with working under pressure in a professional environment need apply. The current requirement is for four shifts which may include 2 x day shifts and 2 x weekend night shifts. Green Papaya is a contemporary Thai and Balinese Restaurant in Woolloongabba and we need a few extra waitstaff to lend a helping hand as we continue to grow. We’re looking for a couple of keen, friendly, hardworking people that must love Asian food. One to help us on weekends and one to work full-time. If you’re interested send an e-mail to giorginavenzin@gmail.com or even better drop in to the restaurant and say hi! We are seeking a Kitchen-hand/Dishwasher for our Café department. The job entitles washing dishes, kitchen cleaning, food preparation and the rotation and putting away of stock. The role is for 4 days with a minimum of 20hrs, must be available for weekend work. 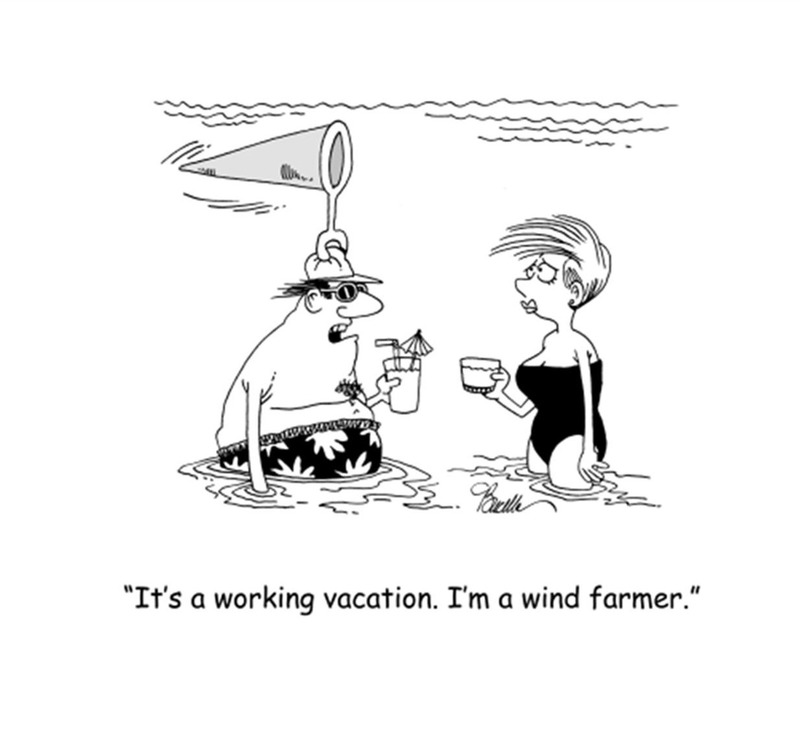 Flexible working days/hours are a bonus. Gambaro’s Restaurant and Function Centre is seeking motivated restaurant and function wait staff. This role offers the opportunity to grow within the business, good hours (25 – 30 per week) and attractive hourly rate plus tips. If you think you meet the criteria and would love to be a part of this exciting venue, please email your CV, RSA. Zoom & Pure NRG cafe (outlet at the Brisbane Central Train Station). We are looking for bright & enthusiastic team players to join us at our busy Central Train Station site. Alchemy Restaurant & Bar is expanding our Floor staff and looking for passionate waiters to join our team. The restaurant is open Monday to Saturday for dinner and Monday to Friday for lunch. Successful applicants will be those who are highly motivated and passionate with a minimum of 3 years in like restaurant. Successful applicants will be emailed. Subway St Lucia (3/242 Hawken Drv St Lucia) are looking for friendly, motivated and bright people to join our team. We are looking for people to fill evening and weekend shifts. If you are highly motivated and looking for a great working environment apply now. Seeking energetic and experienced Bar Attendants for their strong hotel team. Ideally you will have a minimum of 1 years experience working in a fast paced venue. You will also possess current QLD RSA and RSG certification. Your availability must be flexible to work rostered shifts across hotel trading hours, including nights and weekends. Seeking persons with strong hospitality experience for fast paced inner-city cafe. Good hours, Monday to Friday for the right people. Barista minimum 2 years experience. Cafe staff with food prep experience preferred. Chef: For Asia Joes in town. Cleaner: For luxury apartments in Byron (must have ABN and experience). Freelance graphic designer: Great communicator and Adobe CS skills. Waitperson@ Kinoko Japanese Restaurant: Deliver resume in person. Busy surf club restaurant rely on speedy efficient, whinge free wait staff. References essential. Work Available at Laguna Jacks in Hastings Street + two more jobs! The owner of Laguna Jacks is looking for a male with reasonable English to work in the Kitchen as a dishwasher. It involves some heavy lifting. 15 hours per week over Friday, Saturday and Sunday evenings. Go to Laguna Jacks in Hastings Street between 4 pm and 5pm on Wednesday. Zachary’s Pizza Bar is looking for Kitchen staff, and offer good hours and conditions. We are seeking a Chef or Cook to join our team. Formal qualifications are not essential but a love of cooking, creating and presenting good food is a necessity. The position offers approx. 20 to 25 hrs at the moment, we are flexible with arrangements. Please contact me and I will fill you in on details and arrange a meeting. Looking for enthusiastic people who are passionate about the hospitality and service industry and who can demonstrate exceptional customer service combined with a cheerful personality. Your coffee skills must be exceptional and strive to continue learning the art of making great coffee. Previous experience (4 years minimum) in the cafe industry is essential with a great knowledge of coffee. The applicant must hold a current RSA certificate and have flexible availability. Roster include’s days, weekends and nights. Busy cafe & restaurant need wait staff. Located in the Noosa area.Looking for long term staff member with a great personality & heaps of hospitality experience.Fantastic team environment. Wine knowledge & coffee making skills required.Must be available weekends & evenings. Bar/Wait Staff wanted at Azure restaurant in Mt. Hawthorne. $21-$26/hour and Flexible hours Some experience necessary. Click here to apply for this job. Boho is looking for a breakfast Chef/Cook. Funky environment and lots of space to get creative. A cool and a funky spot to grab a coffee, bite and a drink. A bar filled with delicious food washed down with a classic or a crispy glass of beer. As a result, we are currently looking for a talented and passionate Wait and Bar Staff to help us achieve our dreams of a great place with a snappy list of drinks. Think you can do it? Do you have all this and more? Email through your resume without delay and we’ll chat! Exciting rustic, provincial European style restaurant & bar, East Perth waterfront – An opportunity exists for a positive free thinking, customer focussed individuals, with real passion for food & wine coupled with joy of customer theatre & service. To join dedicated hospitality professionals. Attention to detail motivated people with 2 years previous industry experience essential. CANTINA 663 is looking for a coffee master. You will have previous similar experience. We are a fast paced venue, that prides itself on offering a great product. Please only apply if you have great skills, operate well under pressure and love love coffee. Rate is negotiable for the right candidate. Hours will vary between 7am & 5.30pm & some Thursday evenings til 9pm. Seeking the services of a very experienced Barista/Waitperson. You will have to be able to make coffee for many rich and famous people and become an in intregal part of our very friendly cafe. Above award wage is on offer, weekend work is essential with this casual position. Make sure you attend the Lexis Workshop for help with resume writing and interview tips! Spot the bottle of Champagne on FCE teacher Anne’s desk. Michael Aguiar left the Cambridge First Certificate intensive CBT exam class today and gave a farewell speech and a bottle of bubbly to his wonderful teacher. Michael is from Portugal and will travel the East Coast of Australia before returning home. We will miss you buddy, safe travels. Meanwhile the rest of the class are in full ‘lock down’ mode leading up to their Cambridge exam. Good luck everyone. Zachary’s Pizza Bar is looking for Kitchen staff, and offer good hours and conditions. Ph 0457 789 766. I very much hope that you are doing well. I am walking on air after I got my CPE results this morning!!!!! !I am delighted to inform you that I passed with flying colors – 67%. Of course I was hoping to pass with a Grade A or at least Grade B but nevertheless I am ‘fairly content’ with the results. Now I do not have to do a Cambridge course again – what a relief! Thanks again for the entertaining, trying and instructive 13 weeks as well as for giving me a push regarding the Speaking. Although it was not always a bed of roses it was definitely worth while to ‘force’ me to contribute something during the lessons:-). I nearly passed the Speaking with a GOOD!!!! Simply unbelievable! Currently, I am learning french in Montpellier. After three extraordinarily difficult weeks – I did not speak one word of french when I arrived – I now changed from the most advanced A1 class to A2! I hope that in another 21 weeks I will have the ability to take the B2 DELF exam. After that, I should have the required qualifications and more to apply for a job as a Pilot or Air Traffic Controller. Anyway, If I do not forget it I will let you know in a year’s time what I will be doing. 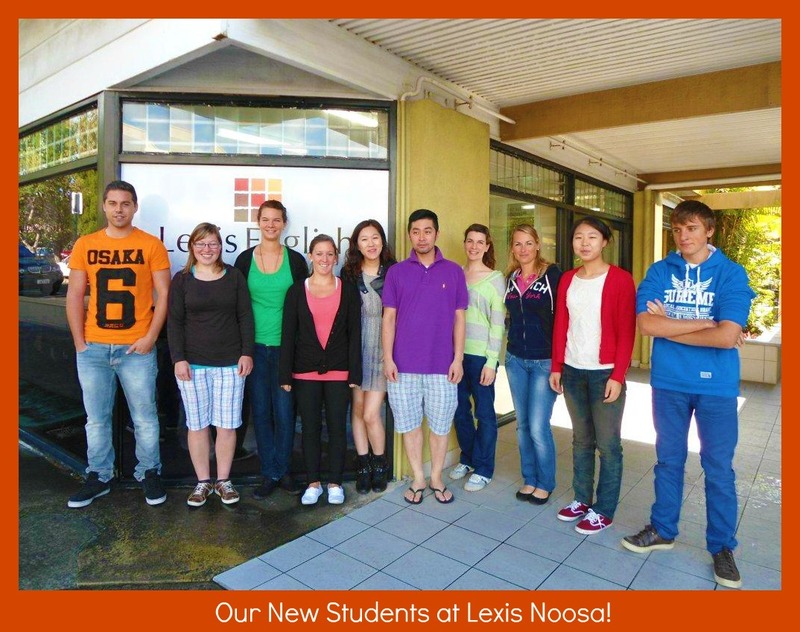 Meet your new classmates at Lexis Noosa! The count down was on at Lexis Noosa! 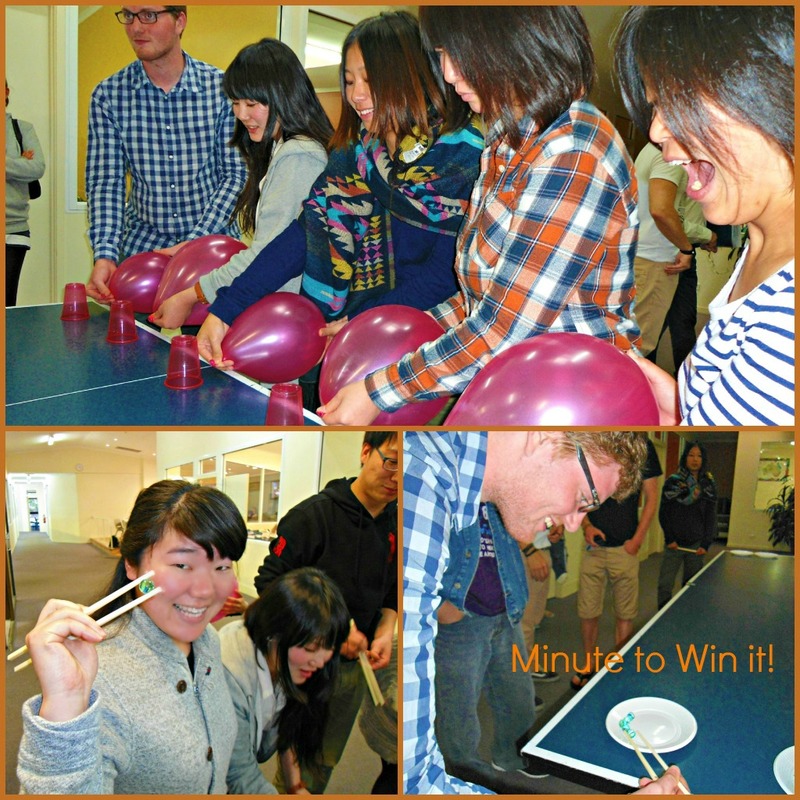 Today’s activity was ‘Minute To Win It’. Some of the crazy games involved transporting marbles from one plate to another using chopsticks, racing a plastic cup along a table with the air from a balloon, re-rolling a roll of toilet paper, and pulling all the tissues out of a tissue box with one hand. It was lots of fun and the proud winning team was ‘Hwany’s Team’. Congratulations! Waitperson Required for fast past club. Must be available for days, nights and weekend shifts. Formal qualification are not essential but a love of cooking, creating and presenting good food is a necessity. We have a small, great, tight-knit team of people in the kitchen and you will be required to fit in with that team. The position offers approx. 20 to 25 hrs at the moment building to 40+ as we get into the season, this would suit someone who has a few hours somewhere else and wants to earn a bit more at this stage, we are flexible with arrangements. Contact Chef direct on mobile below. Located in the Noosa area. Looking for long term staff member with a great personality & heaps of hospitality experience. Wine knowledge & coffee making skills required. Must be available weekends & evenings. Coolum Beach Surf Club is absolute beachfront with amazing views. Why not have a view to die for as your workplace every day. We are currently seeking a super star customer service oriented, hard working Bistro Staff member to join our busy Beachfront Bistro team. We do require you to have a minimum 2 years experience in a busy Bistro or Restaurant and that you hold a current Queensland RSA. The ability to work split shifts, nights and weekends is a must. Club Award Casual rates apply. Lexis Noosa student makes a special treat for his classmate! Swiss / Portuguese student Michael made a beautiful sweet rice cake to say goodbye to Jean Wang today. Michael and Jean are studying in our Cambridge First course. Fridays are full of friendship at Lexis Noosa! Thank you pre intermediate class B for giving your teacher Michelle such a lovely surprise today. 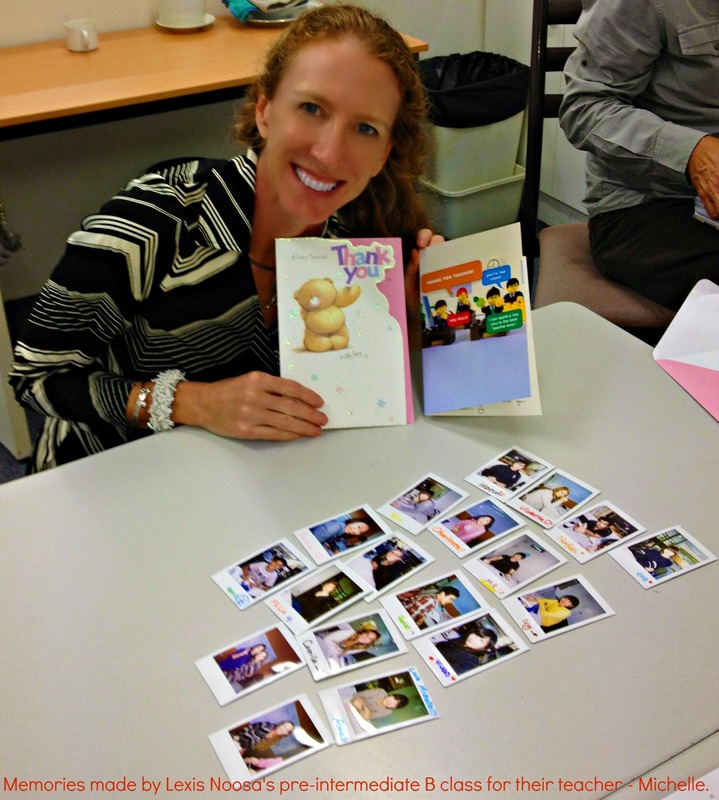 Every student gave Michelle a signed photo and a card with a message to say ‘you are the best ever’! 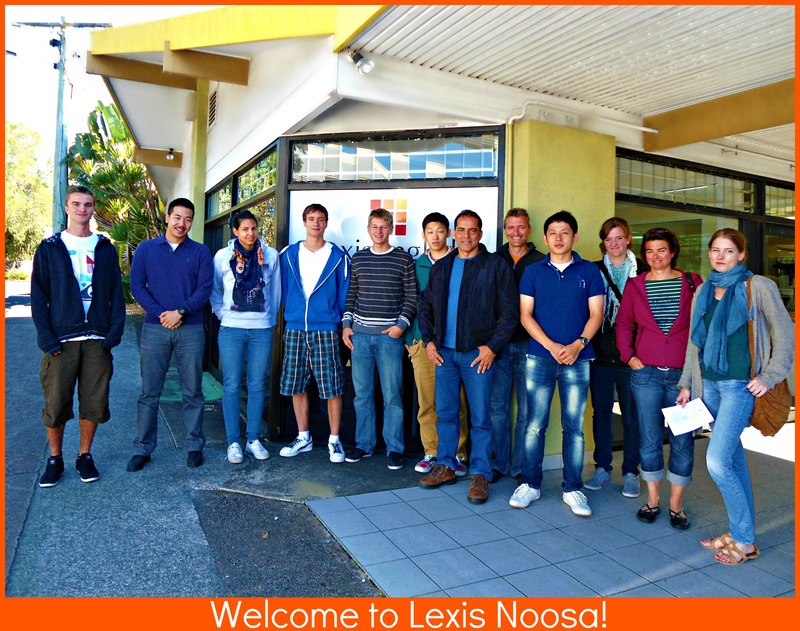 Lexis Noosa is proud to have such popular teachers in our general English as well as our Academic classes! Check out these available jobs in Noosa! Aromas Noosa are looking for enthusiastic people who are passionate about the hospitality and service industry and who can demonstrate exceptional customer service combined with a cheerful personality. 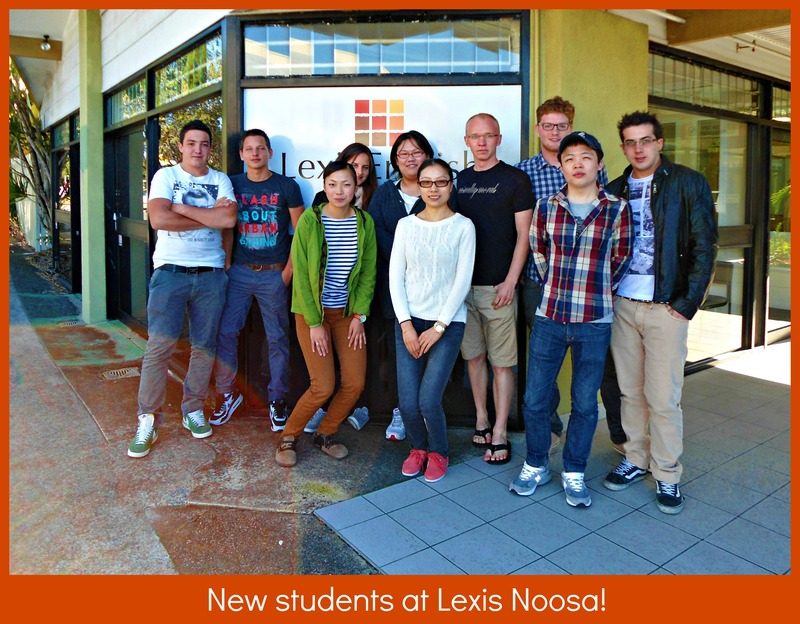 New Starters at Lexis Noosa! 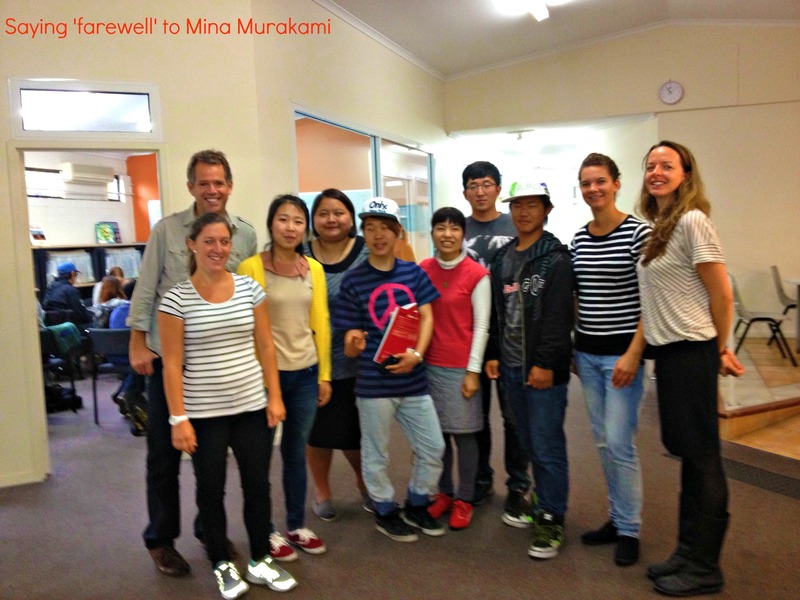 Teachers Zoe and Michael say farewell to Mina Murakami today. Mina is sad to be leaving all her classmates but will be happy to be with her young daughter again – we’ll miss you Mina, Goodluck! 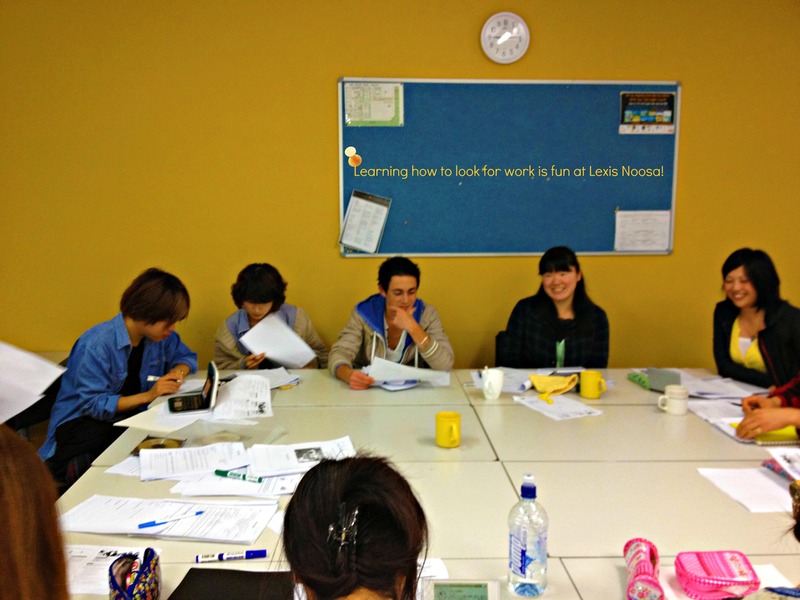 Noosa students work it out at the Lexis Job Workshop! Our students are on a fast track to good jobs in Noosa! 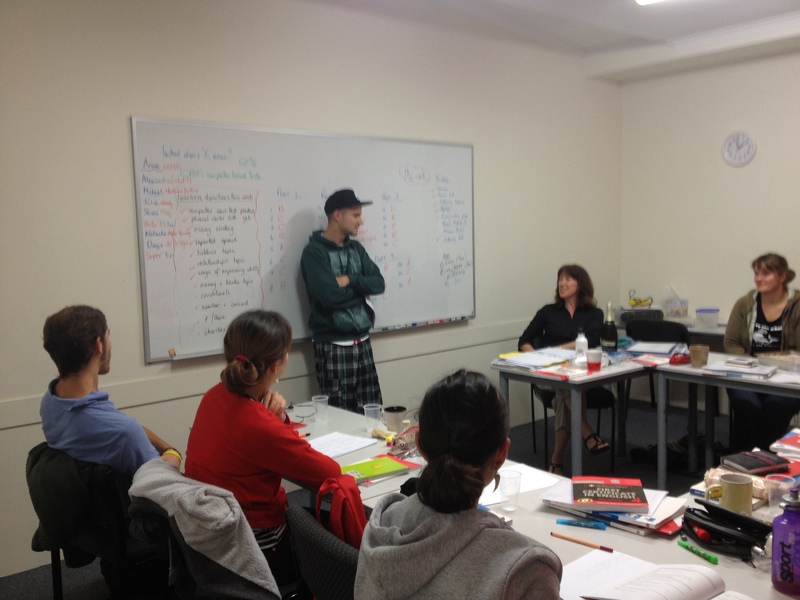 The Lexis Noosa Job Workshop was buzzing today with teacher – Phil giving valuable advice on how to achieve employment in Noosa. 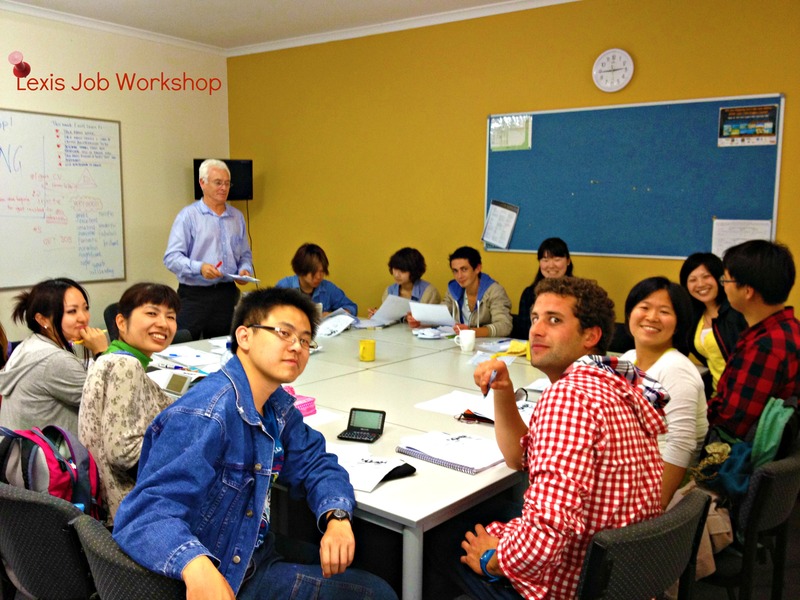 Lexis English Job Workshops – Tuesdays and Wednesdays from 2 pm to 3 pm. Check out some available jobs below! A BIG welcome to all our new starters this week! It was an intense competition. We had eight teams fighting for a place in the grand final, but it was Ko & Misato versus Diego & Hiro in the final match. There were some amazing shots and the spectators cheered on enthusiastically. 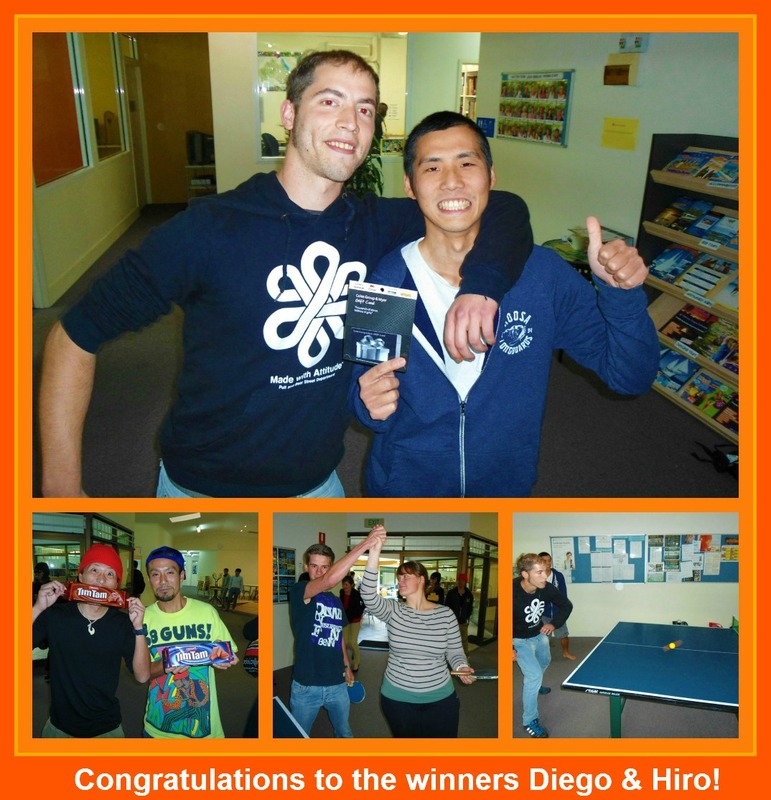 Congratulations to the winners Diego & Hiro! Enjoy your prize. 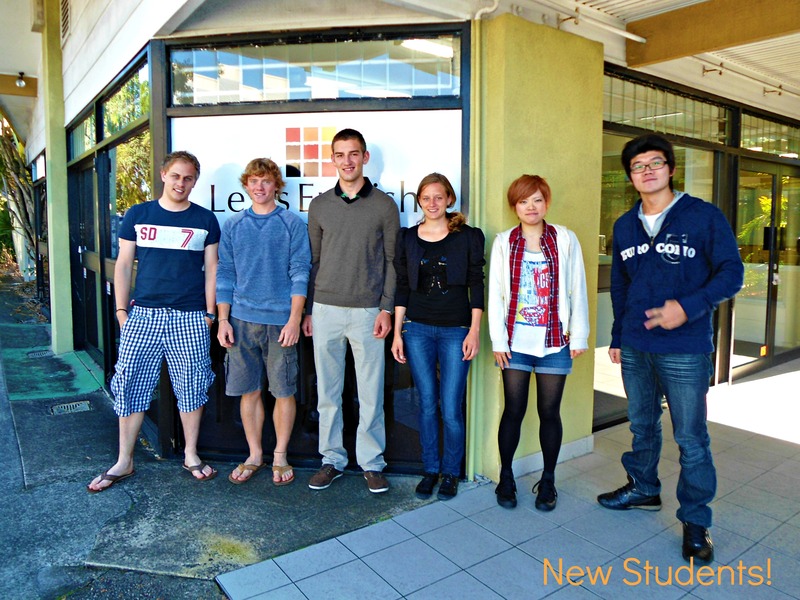 Lexis Student – Blue, brings a nice surprise to the Noosa campus! 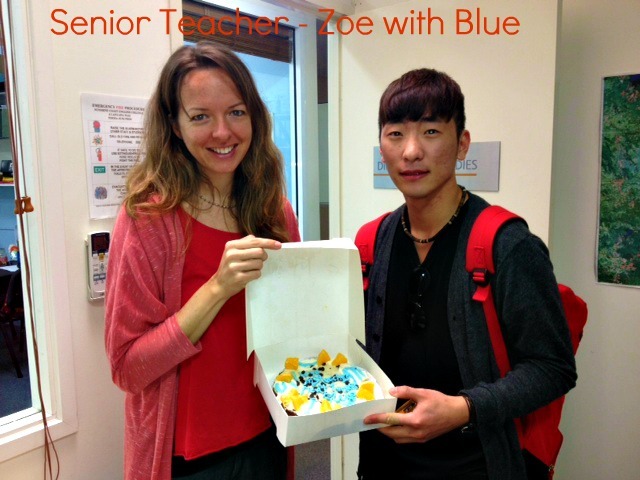 Meet Kim (blue) Muyoung with Senior Teacher Zoe, presenting a cake he made himself to the teachers to say thank you. Blue leaves today but is staying in Noosa until October, as he scored a great job working at rock salt restaurant. Good luck Blue! Nina, our Manager of Cambridge Exams & Assistant Director of Studies – booking student travel! 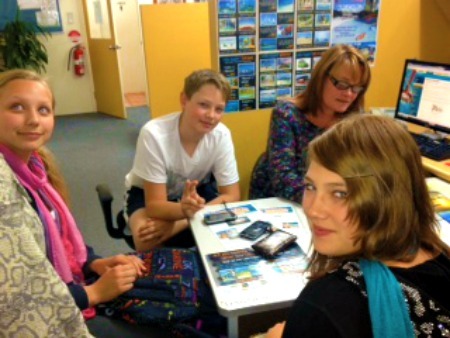 Meet our our wonderful Russian students planning their excursions with Nina! Students: Violetta, Viktoriya and Artyoum. Feel like a Fraser Island Adventure? 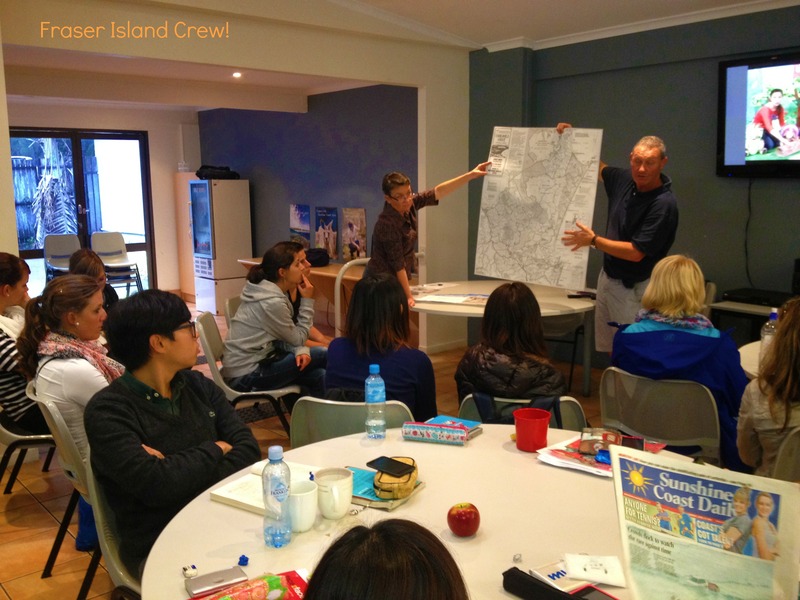 Join the Fraser Island 2 Day Adventure – 14th July 2012! Dinner: taste a true Aussie BBQ cooked by our all Australian tour guide. 180g Rump Steak, mash potatoes and a selection of fresh stir fried vegetables. BOOK NOW with Beth/Cathy to secure your seat on this exclusive Lexis English tour. The Competition heats up at Lexis Noosa with a delicious Hot Dog cook off! 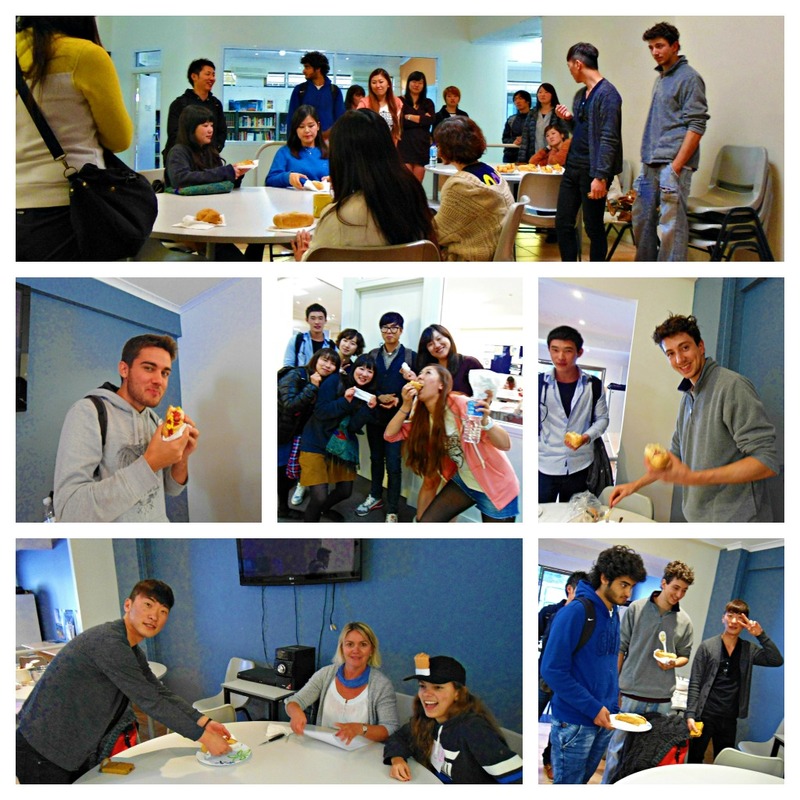 Lexis Noosa Students were cooking up a serious Hot Dog storm! The Hot dogs were judged by Isabel and Student Services Officer – Cath. Judging was based on presentation, taste and creativity. Congratulations to Jonatas who won a Coles Myer voucher! UAE PG VS SANG – SOCCER TOURNAMENT! 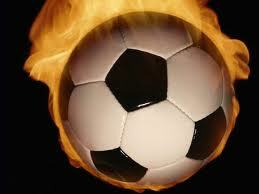 Come and support your team there will be a cheap sausage sizzle, prizes and fun! 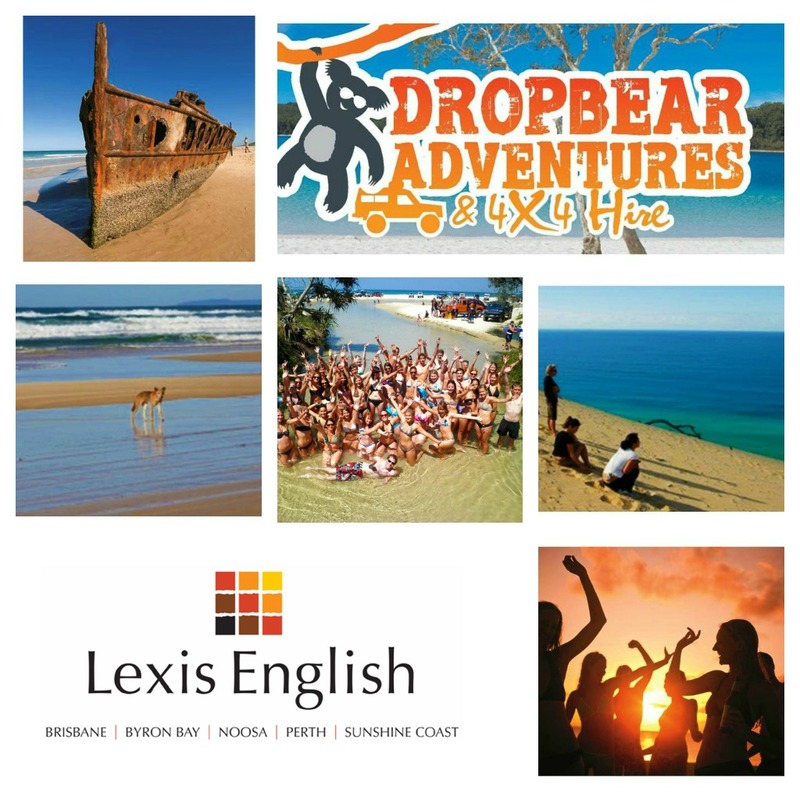 Lexis English – Top 10 Things to Do in Noosa! Swim, surf, relax and sun-bake! Main Beach is one of the Noosa’s most lovely beaches, but realistically there are more beaches then you could poke a stick at- Sunrise Beach, Sunshine Beach, and Tea tree Bay. Noosa is one of the few places that Australia Zoo runs their FREE bus from. Cuddle a Koala, feed a Kangaroo, see Elephants, Crocodiles and heaps more! Arrange a tour to beautiful Fraser Island. Fraser Island’s World Heritage listing ranks it with Australia’s Uluru, Kakadu and the Great Barrier Reef. Fraser Island is a precious part of Australia’s natural and cultural heritage, it is protected for all to appreciate and enjoy. The Farmers Market runs every Sunday and sells the yummiest, freshest produce in town! The Noosa National Park is one of the most amazing areas in Noosa. The coastal walks have amazing cliffs drops, trees and sandy beaches- keep an eye out for Dolphins and those elusive Koalas! Noosa is renowned for its award-winning restaurants and cafes, with an abundance of fresh, local and delectable produce prepared by dedicated and experienced chefs. This cruise goes along the Noosa River, while the sun goes down- so nice! Even better, they allow you to bring your own drinks – they’ll even provide glasses and ice. This is a popular choice for International students! All BBQ’s are free, all you need to grab is some food, drinks and friends and head to one of Noosa’s beautiful national parks for a BBQ. Noosa is a popular resort town and as such, hosts many exciting events! Noosa festival of surfing, International Food and Wine festival, Jazz Festival, Noosa Triathlon and the Noosa long weekend (just to name a few). 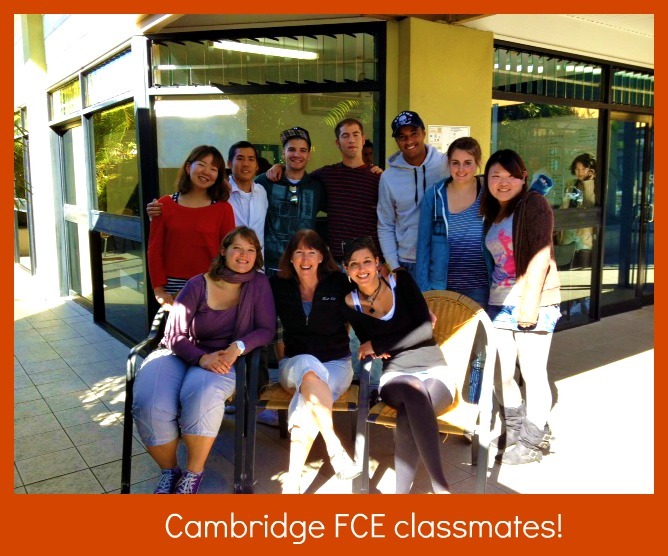 Meet our Cambridge First Certificate Students! Alexandre (Brazil), Michael (Portugal), Ju Hee (Korea), Shiori (Japan), Dilan (Switzerland), Natacha (Ukraine), Diego (Spain), Hiroyuki (Japan), Julia (Switzerland) and Anne our fabulous FCE Teacher! What a great nationality mix!